​With Vehicle Electrification and ADAS (Advanced Driver Assistance Systems) now in the mainstream automotive market, the diagnostic lines have been blurred between microcontrollers (MC), electronics devices, and network systems. 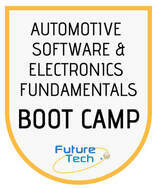 Highly complex software (S/W), firmware (F/W), and hardware (H/W) interface systems in modern automotive architectures are compelling automotive industry service and diagnostic professionals to cultivate new knowledge and skills to more fully understand, analyze, and diagnose modern vehicle systems. The Automotive Software & Electronics Fundamentals course is designed to give automotive service professionals a fully-immersive environment for learning how to work with advanced automotive systems. 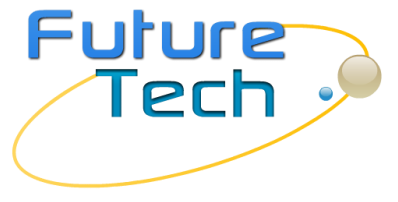 Whether it be a Tesla Model S, Chevrolet Volt, or Toyota Prius, all electrified vehicles have complex software, electronics, and network systems ​that will affect how they perform and thus, how a technician will diagnose and repair them. 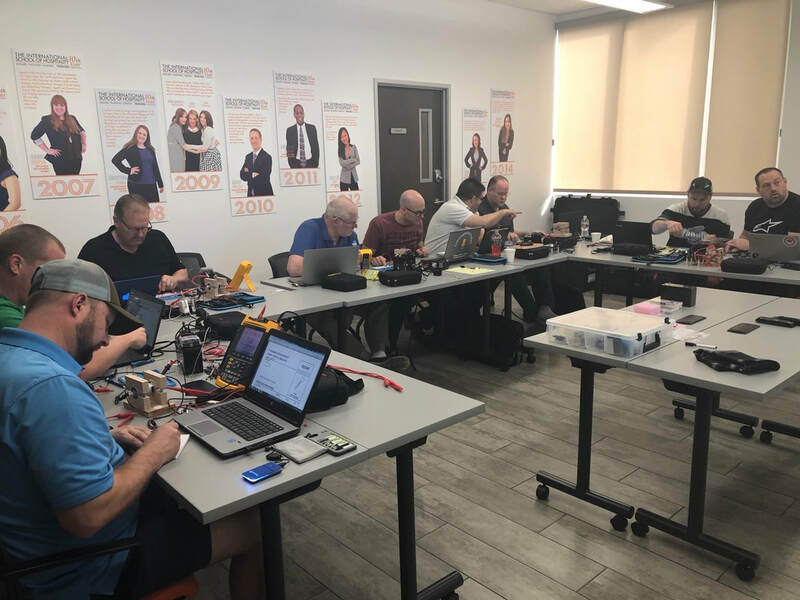 In this boot camp participants will look beyond parts (high voltage batteries, for example) and into the software and electronics that drive them. Participants of these boot camps can expect hands-on experience from 8:30AM on Monday morning to 4:30PM on Friday afternoon, stopping only for lunch, beverage and snack breaks (provided to participants). Seats are limited and early registration is recommended. Automotive Instructors and Technicians are constantly being challenged by changes in electronics systems and control software in advanced automotive systems. This course contains lecture with significant hands-on project content that will make for the perfect learning environment! Using the popular Arduino Microcontroller, participants will be introduced to MC and electronics to build new hardware (H/W), firmware (F/W), & software (S/W) knowledge that can be used directly with automotive systems. The lecture and significant hands-on project content in this course, using the popular Arduino MC, will introduce participants to the world of Electronic Devices, MC, Software Writing, and Software Coding. Automotive Instructors will develop skills to develop MC based classroom simulators, demonstrators, and develop student projects in a fun environment. Simulator and demonstrator systems are significant investments for the modern automotive classroom and this course will teach participants how to inexpensively create their own simulator and demonstration systems. Automotive technicians will develop skills to develop MC (software) based diagnostic systems that can be used to manipulate or control vehicle systems. 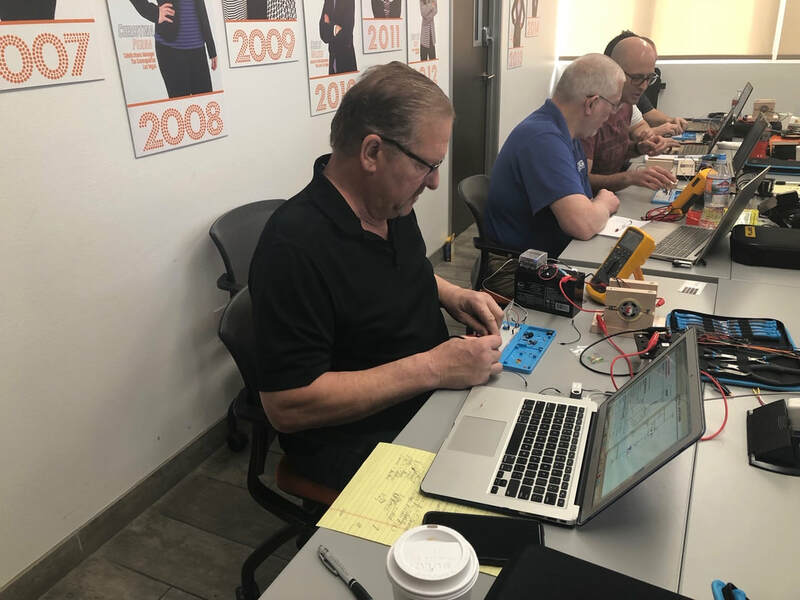 Whether the technician wants to monitor control systems, inputs, or outputs this class will instruct them how to quickly make control systems to do it! The technicians will also learn how simple electronic and software circuits can be used with the Scan Tool to develop circuits that can make complex diagnostics easier! Information essential for individuals that want to architect vehicle “bugs” for courses or, develop circuits and software to focus on specific diagnostic objectives. Analog and Digital Signal Conditioning: The purpose of Signal Conditioning is to ensure that external signals can safely connect the MC to the outside world of motors, relay drivers, sensors, other controllers, networks, and more: This course will cover Why and What is needed, and How to build Analog Digital Signal Conditioning circuits that will interface with the MC. As part of learning and interfacing Signal Conditioning with the MC, it is necessary that participants understand the operation and application of electronic devices. The focus will be how to use these devices for building Signal Conditioning and Control Systems, and how to use these devices with a MC. Preparing to Develop a Project Software Solution – and should answer the following questions: 1) What does it need to do?, 2) When does it need to do it?, and 3) How does it need to be done?